Ayala's Bill Montagne reveals the trade-secret methods behind his cured fish boards. Slivers of cured meats, pork pâté, and chicken terrine are standard pre-dinner fare, accompanied by wine enjoyed at the bar or at home. 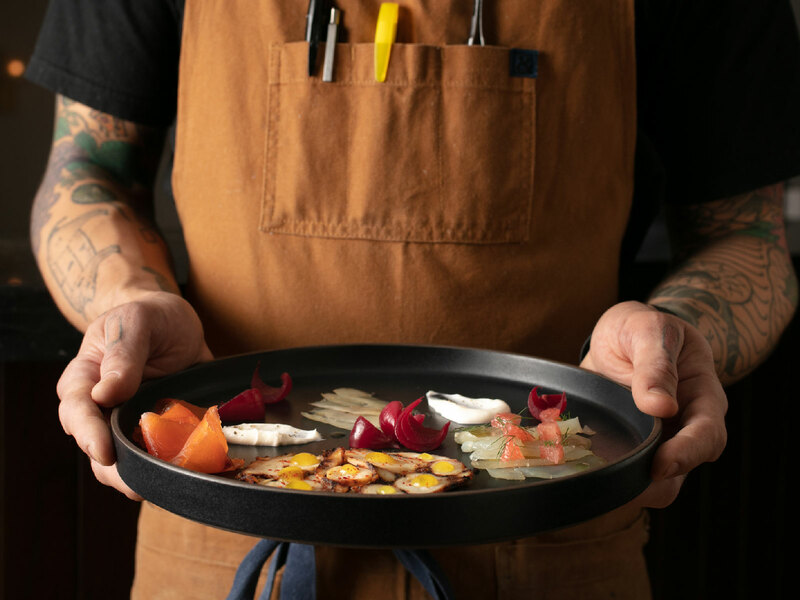 While salumi boards at restaurants often offer a first look into the chef’s product and technique, fish boards are the name of the game at a new seafood restaurant in San Francisco called Ayala, where fish is custom-cured based on variety. Ayala is chef-partner Bill Montagne’s (Le Bernardin, Nico Osteria) first venture on the West Coast, and he brings with him years of experience not only working with seafood, but learning, testing and honing his technique curing different kinds of fish. It was New York's Gray Kunz who taught him how to cure fish. Snaggletooth, his intimate 17-seater in the Lakeview neighborhood of Chicago, was a testing ground for these concepts, and the perfect preparation for Ayala. “San Francisco has a history of great raw bar offerings since we’re so close to the ocean, so it’s a natural extension that we would have a great raw bar program. But then we’re taking that raw bar offering a step further and asking, ‘What if we did cured fish?’ It just feels right,” says Montagne. 1. Wrap your fish filets in cheesecloth. Montagne wraps cheesecloth around the plain filet before applying his cure. His curing mixture always includes salt, sugar, a liberal amount of herbs, acid, and alcohol to create a wet sand-like mixture, completely barring the dry rub. The acid, salt, and sugar help break down not only the proteins in the fish, but also help activate the herbs in the mixture, enabling them to permeate the filet. Montagne guesses that the more complex cures have as many as 25 ingredients, such as the one he uses on his trout and citrus menu selection. 2. Consider the flavor, texture, and size of your fish. Even before the cheesecloth is applied, scores are cut into thicker filets of fish before they’re wrapped so the curing mixture will more easily penetrate the thickness of the filet. When deciding what to include in each cure, he customizes the blend to the fish's texture, thickness, and richness. “With Pacific halibut—because it’s leaner and smaller—when it cures, it’s going to be drier. It wouldn’t make sense that to cure something that dry with a very deep, earthy flavor. So, I would never do a porcini-cured hailbut ... whereas with a fish like black cod, it’s richer, so you could use more earthy flavors to match it,” says Montagne. 3. Make sure weight is applied to each filet while curing. The cure mixture is spread out into a layer on top of an elevated surface, such as an upside-down hotel pan, on which the cheese cloth-wrapped filet is then rested, skin side down. Another cure layer is spread on top of the fish, encasing the filet, and then another pan is rested on top of that. Since Montagne is curing multiple filets, he’ll often continue building upon alternating layers of cure, filets, cure, and pans, with the weight of each layer helping to permeate the mixture through the cheese cloth. When curing just one filet, he recommends placing a weight on top of the top pan to create the needed pressure. Montagne cures his fish for anywhere from seven to twelve days, as opposed to the traditional 24 hours. The advantages of this much more labor and storage intensive method over the traditional method include a gentler and much more even cure, as well as preservation of product. When the cure is rinsed off the filets after being applied directly to it, the top layer of fish inevitably is washed away with it. There’s also a prevention of a dry outer layer appearing on top of the filet, known as a pellicle. “All that salt and sugar are very corrosive; they break down protein and you’re applying it to the directly to the fish [in the traditional methods]. The outside is over-cured and the inside is under-cured,” says Montagne. Wine notes: Wine director Nick Tilly recommends pairing the fish board with a rosé from Domaine Migote in Lorraine, France made with Pinot Noir and Gamay grapes, which Ayala offers by-the-glass, or the Vermentino from Selvadolce from Liguria, Italy, which is available by the bottle.